Kinetics designs and manufactures high quality, conservatively rated, dry type transformers in the 1 KVA to 2,500 KVA capacity range, up to 15 KV class. A power transformer is a critical component in any rectifier, power supply or excitation system. 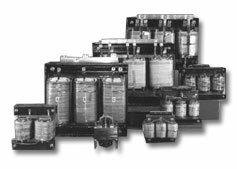 Dry type transformers are a rather mature product and technology but, of all the components in a power system, a transformer replacement can be a physically challenging event, extended delivery of a replacement or repair unit and expensive transportation costs. Kinetics began designing and manufacturing all our own transformers in the early 1960s to assure that the transformers within our products are of the highest quality standards. As a critical component in the performance of our power system products, Kinetics desires to take total responsibility for the transformers, chokes and reactors within the units we manufacture. In-house design and manufacture of transformers permits Kinetics to offer customers expedited deliveries and accommodating specialty designs at a reasonable price. For customers seeking a dependable heavy industrial dry type transformer, Kinetics will apply our many years of application experience to manufacture units of the highest quality to a customer's requirements. The preferred coil conductor used by Kinetics is copper. Aluminum conductor is available upon a specific customer request. Kinetics' in-house fabrication department enables Kinetics to offer transformers in enclosures to fit the application or environment, such as NEMA 1, 3R, 4, 4X and 12. Kinetics, your one source solution.